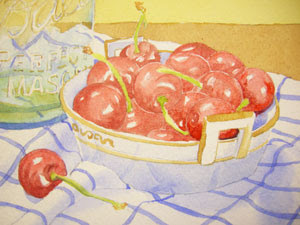 Today I am using a variety of reds from my palette to develop more depth in the cherries. I used Permanent Alizarin Crimson, Perylene Maroon, and Winsor Red primarily. I like to use these colors because they are transparent and so when I glaze with them the colors underneath will show through. This makes the colors vibrant and rich. 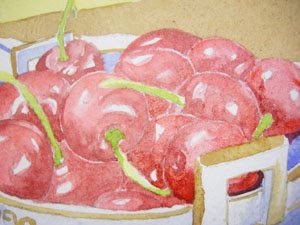 I added some Permanent Sap Green and Burnt Sienna to the stems on the cherries.